Car Donation Foundation d/b/a Vehicles For Veterans recently donated to Hope For The Warriors, Intrepid Fallen Heroes Fund and Folds of Honor Foundation. The Car Donation Foundation (“CDF”) and its Vehicles For Veterans campaign added three benefiting charities: Hope For The Warriors, Intrepid Fallen Heroes Fund and Folds of Honor Foundation. These new charities received proceeds from vehicle donations due to their contributions to United States veterans. For veterans, Hope For The Warriors provides clinical health and wellness services, help with all of life’s transitions, and they provide sports and recreation programs. Intrepid Fallen Heroes Fund serves United States veterans suffering the effects of Traumatic Brain Injury and Post-Traumatic Stress. Folds of Honor provides educational scholarships to spouses and children of fallen and disabled American veterans and service members. Vehicles For Veterans supports these missions and several other charities from all around the United States with a focus on helping the veterans of our country. 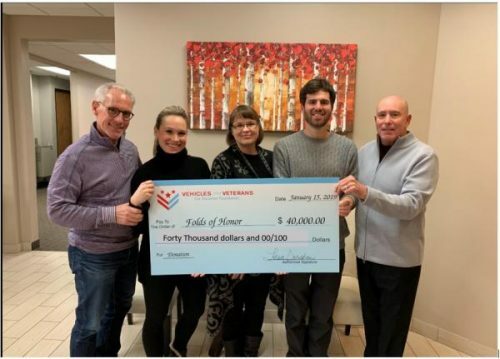 “We are truly humbled and grateful for this impactful gift,” Megan Cron, Folds of Honor Regional Director Development, said. Overall, Car Donation Foundation and its vehicle donation programs focused on helping children and veterans has donated over $65 million to recipient charities since its founding in 2010, and will continue to benefit great veterans’ charities like these. Car Donation Foundation is a 501(c)(3) vehicle donation organization d/b/a Vehicles For Veterans which supports disabled and other veteran programs across the U.S. with the proceeds from vehicle donations. Vehicles For Veterans donors receive free towing and a receipt for tax deductibility.